Rocking all over the board! In our recent Kill Team game we realised that scenery was fairly important and that we needed more scenery, in particular more line of sight blocking and area terrain. Now you can buy some very good scenery but I wanted to build at least some of my own. 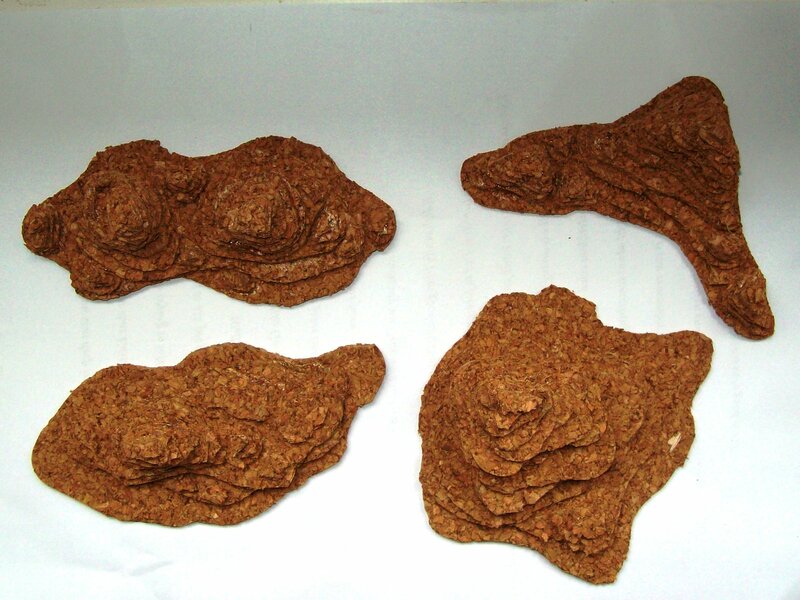 These cork mat based rocks are cheap and very, very quick and easy to make. Cork drink coasters: These are €0.99 for six from Xenos in The Netherlands. The four rocks shown took about 1 ½ packs (9 coasters). Cork mats are soft and easy to cut and tear. 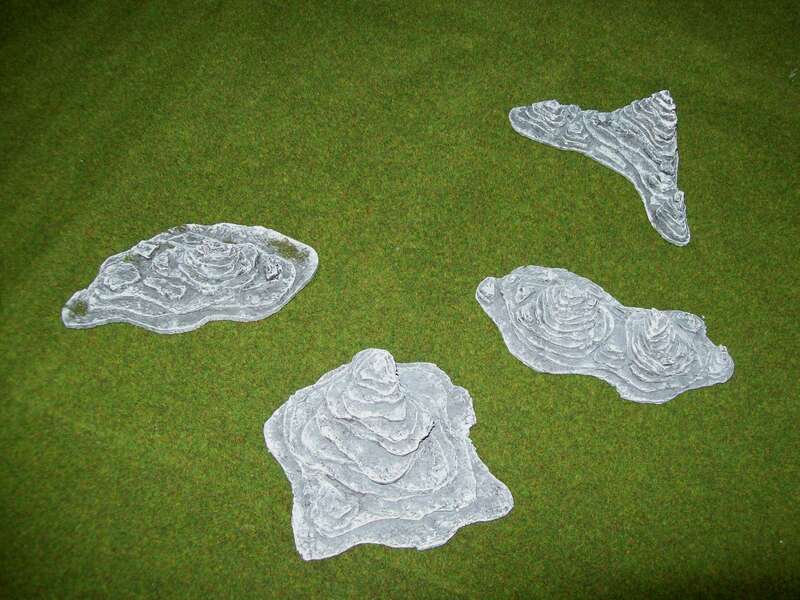 To build your rocks cut out a base shape for your rock- a blob or a splat shape. Cut out the next layer. It should be slightly smaller than the base layer. Don’t worry about measuring your rock though, just do it by eye. Rocks are natural structures, you don’t need to be neat or accurate. Spread glue on it and place it on top of the base layer. You may have to weigh the first few layers down while they dry to stop them curling up. Keep building up layers of cork until you have a “rock” of the right height. You can play around with stacks or multiple peaks. Leave your rocks to dry before spraying them grey. I used Army Painter Uniform Grey spray paint but if you want you can undercoat and paint the rocks by hand (I’m going for speedy here). Apply a heavy wash of Nuln Oil and leave to dry before drybrushing with Longbeard Grey and that’s it- rocks! You can jazz them up a little with clumps of grass or splashes of lichen but I’ve left these ones mostly plain for now. Turns out that we need even more scenery (of course) but these are a start. So, I played a game of Kill Team with my Space Wolves against my boyfriend’s Orks last weekend. I’d like to say that it was a game of keen strategy and great bravery, but my leader hid in a forest and I was tabled on Turn 5. My dice weren’t great but my list was rather rubbish. It wasn’t so much that the units themselves were bad but the cost of the models meant that losing one Wolf Guard biker to a lucky shot from a DeffKopta in turn one was a complete disaster. I’m going to have to rethink this a bit, I’m not sure that a small elite army is going to work in Kill Team unless I’m facing a small elite army. The game was good fun though and very fast, although in future I think we’ll be working out our specialists when we build our lists, not while setting up. Splitting up the codex units into units of one was fun, although it strongly affects going into assault as, when you shoot at a model and kill it, you then have nothing to assault, which when you’re within six inches of rather a lot of Orks, is a bit irritating. Again it’s something tactical that I’ll need to deal with. Over all, I enjoyed the game and think that we’ll get quite a lot of use out of the Kill Team rules. They look like they might be a good for expansion too. Because Kill Team is at such a small scale, heavy scenery becomes more practical, so we could play games set in a jungle or a city, or build multiple levels. I’m also tempted to see if Kill Team could be blended with Codex: Inquisition. I can see the potential for fluffy Inquisitorial warband (minus Inquisitor I guess) versus the galaxy type games. Just to round out my post I guess that I should present the list. I would not recommend taking my Space Wolves list though (I’m abandoning it). Well, another year done and I have to admit that hobby-wise I didn’t paint anywhere near as many models or play as many games as I’d have liked. I most certainly didn’t post as much as I should have (or wanted to). I don’t really know why, although I know my Space Wolf and Blood Angel plans were scuppered a bit by the unavailability of the new spray paints here in The Netherlands, which kind of put me off painting them a little. Hopefully I will find a good excuse to drag them out again soon. I still have another “Joy of Kitbash” to go after all! I’m not going to hurry with my Exodites, they are going to be my “showy” army, after all. My next priority for them is to build and paint the rest of my Shining Spears, after which I may paint an HQ choice so that I can consider using them as allies. 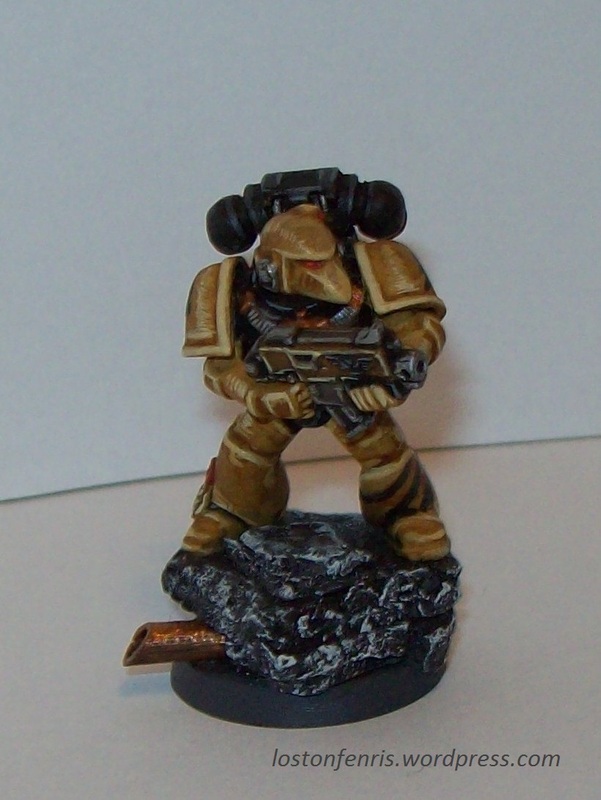 I built this Marine Malevolent Tactical Marine as a test model for the new(ish) Citadel paints. He no longer looks quite like this as I have applied copious amounts of various Special Effects paints on him. There’ll be a post on the paints (sometime) but I’m still trying to get the hang of them. I’ll probably build a few more of these guys to test them out, partly because they are grim, battered, morally on the darker side of grey (see any of the Salamander books and Bitter Salvage– all by Nick Kyme) and partly because I think that I’d like to build enough Space Marines for a Kill Team. Perhaps I’ll get round to playing a few more games if they are at a lower points level. I’ve skimmed through the rules and when we both have a few hours to spare I guess we’ll have to try it out (though we need to find a hill somewhere if we manage to roll a “5” on the mission chart!). Anyhow, that’s it for now. Here’s to the new year and much hobbying ahead!